Note: You can read my review of Hosseini's A Thousand Splendid Suns and read my preview for his recently released short story/picture book, A Sea Prayer, as well. "So, then. You want a story and I will tell you one...Afghanistan, 1952. Abdullah and his sister Pari live with their father and stepmother in the small village of Shadbagh. Their father, Saboor, is constantly in search of work and they struggle together through poverty and brutal winters. To Abdullah, Pari - as beautiful and sweet-natured as the fairy for which she was named - is everything. More like a parent than a brother, Abdullah will do anything for her, even trading his only pair of shoes for a feather for her treasured collection. Each night they sleep together in their cot, their heads touching, their limbs tangled. One day the siblings journey across the desert to Kabul with their father. Pari and Abdullah have no sense of the fate that awaits them there, for the event which unfolds will tear their lives apart; sometimes a finger must be cut to save the hand. 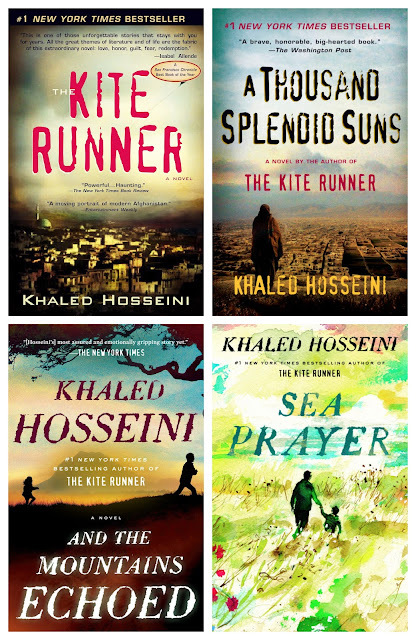 Crossing generations and continents, moving from Kabul, to Paris, to San Francisco, to the Greek island of Tinos, with profound wisdom, depth, insight and compassion, Khaled Hosseini writes about the bonds that define us and shape our lives, the ways in which we help our loved ones in need, how the choices we make resonate through history and how we are often surprised by the people closest to us." "All good things in life are fragile and easily lost." "Once upon a time, in the days when divs and jinns and giants roamed the land, there lived a farmer named Baba Ayub. He lived with his family in a little village by the name of Maidan Sabz. Because he had a large family to feed, Baba Ayub saw his days consumed by hard work. Every day, he labored from dawn to sundown, plowing his field and turning the soil and tending to his meager pistachio trees. At any given moment you could spot him in his field, bent at the waist, back as curved as the scythe he swung all day. His hands were always callused, and they often bled, and every night sleep stole him away no sooner than his cheek met the pillow. I will say that, in this regard, he was hardly alone. Life in Maidan Sabz was hard for all its inhabitants. There were other, more fortunate villages to the north, in the valleys, with fuit trees and flowers and pleasant air, and streams that ran with cold, clear water. But Maidan Sabz was a desolate place, and it didn't resemble in the slightest the image that its name, Field of Green, would have you picture. It sat in a flat, dusty plain ringed by a chain of craggy mountains. The wind was hot, and blew dust in the eyes. Finding water was a daily struggle because the village wells, even the deep ones, often ran low. Yes, there was a river, but the villagers had to endure a half-day walk to reach it, and even then its waters flowed muddy all year round. Now, after ten years of drought, the river ran too shallow. Let's just say that people in Maidan Sabz worked twice as hard to eke out half the living." First off, if you are not aware, it is essential that you understand that Khaled Hosseini is an amazing writer. If you have not yet read any of his books, you are really missing out on beautiful language, masterful craftsmanship, and emotional, power-house books that will blow you away. The Kite Runner will rip your heart out and mend it again. A Thousand Splendid Suns will make you angry and then make you weep. His first short story/picture book, Sea Prayer, is due out this fall and I cannot wait to read it. He's a phenomenal writer and his level of writing stands above most of his peers. 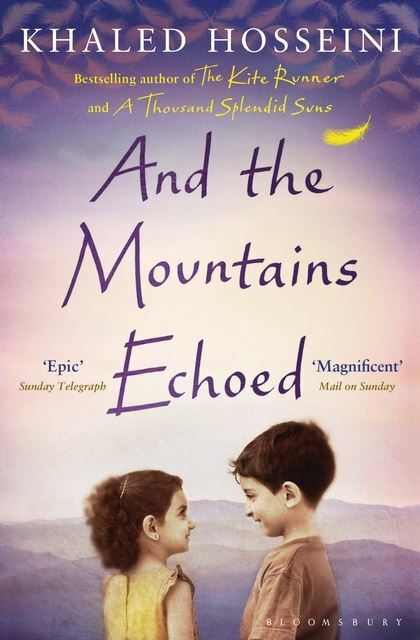 And the Mountains echoed is a perfectly titled novel. The book is essentially a series of intertwined short stores that propel the audience forward through a series of journeys all starting with a fairy tale told by a father to his two young children. This fairy tale establishes what will be the repeating but also evolving themes within this book: commitment versus abandonment and emotional fidelity versus imposed distance. Essential, the book is an investigation of the choices we choose to make or not make when it comes to keeping our relationships whole. In the poor community of Maidan Sabz, a father is compelled to sell one of his children to a childless couple in exchange for the money he needs to keep the rest of his family alive. What follows is a beautiful if heartbreakting stained glass composition of the lives in and around this one choice. Generally speaking, I do not usually love short stories. I rarely choose to read them if unassigned. 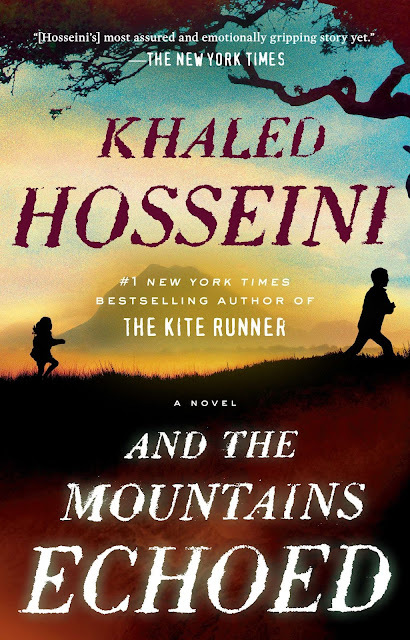 I would much rather sink into a novel or least a novella, so it speaks volumes that I was not only engaged in each story, but that I ended up loving that Hosseini chose to craft the story this way. It could not have been better told in another narrative mode. Overall, I give the gook four stars in comparison to how much more I loved his five-star knockout novels The Kite Runner and A Thousand Splendid Suns, but Hosseini's writing quality is so superior to many of his contemporaries that to me it merited a bump up to a 4.5 out of 5 star read. I am very much looking forward to his new book.